I'll admit I have never played that much ping pong in my day. Air hockey and eight ball were more my games. 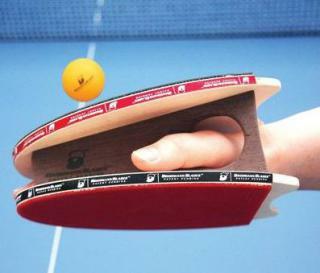 However, during the few times that I played, I never really had a problem holding onto the paddle. Nor did I think a pair of paddle-mittens was in order. Anyone else? Then again, once you got used to these Table Tennis Mittens from Hammacher and Schlemmer, I'd imagine they'd provide pretty comfortable play--like a big, flat extension of your own body. The product description claims that users will get better ball control, faster vollying, improved backhand and better spin. You'll also look like a giant fruitcake. But fear not, performance activewear was never about style (see cycling shorts or competitive swimsuits if you disagree). If you're really over-the-top into table tennis, you could even wear these mitts out on cool winter afternoons to protect your money makers and show your love of the game. Just prepare to be kicked and punched spontaneously. In case you were wondering (you probably weren't), the Table Tennis Mittens are made from laminated birch with latex pads. I don't know that these meet regulations, but who the hell plays regulation ping pong anyway? What Is A "Mobility Denial System?"